As a dietary supplement, take 2 capsules daily. Which do you want to ELIMINATE with KRE FX KRE ALKALYN ? Don't settle for unstable creatine that converts to creatine before reaching muscle! * KRE FX kre alkalyn promotes the results you crave from creatine......WITHOUT puffy bloating or the hassles of loading and cycling. * All thanks to pH-CORRECT TECHNOLOGY FROM KRE FX. 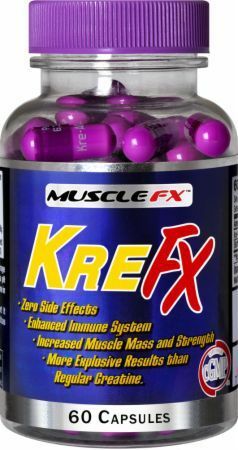 KRE FX kre alkalyn is a real deal!